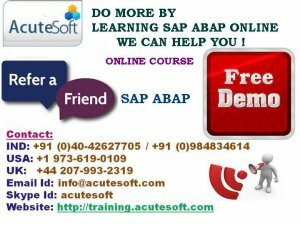 Acutesoft provides Online training on SAP ABAP by real time Experts and having excellent domain technical and SAP Knowledge in the relevant Module. ABAP (Advanced Business Application Programming) is the programming language used to develop all SAP ERP applications. Today, with more than 43,000 customers worldwide, SAP is one of the most widely used ERP application. Needless to say, the demand for SAP Certified ABAP Consultants is constantly growing. Join SAP uAcademy ABAP course and get an entry into the most happening sector of the IT industry. SAP CRM TECHNICAL, SAP GRC, SAP FICO, SAP SD, SAP WM, SAP PP, SAP MM, SAP SRM, SAP FSCM, SAP MDM, SAP APO, SAP IS RETAIL, SAP CRM, S, SAP BI, SAP BO, SAP HANA, SAP BPC, SAP ESS-MSS, SAP CS, SAP PLM, SAP GTS And SAP SNC.